The video installation consists of a digital video projector, DVD of the video, DVD player, ventilator, thin plastic tablecloth from China. A thin tablecloth is hanging on a white wall being moved slowly up and down by the wind. This wind is created with a ventilator. The image that is projected on the tablecloth shows an outside location in Beijing of a huge plastic bottle collection, and a young girl walking around in her habitat. The projected image is focused on the white wall behind the tablecloth. From the start it looks as it the video image stands still, because the video on the tablecloth is out of focus, and the tablecloth moves in the same rhythm as the slow motion video. At first the video seems to be hardly visible and distorted, but when the tablecloth moves up by the wind, the video becomes clear as well as the walking movement of the girl. In this work I wanted to make use of different layers in a literal way. Firstly I made the choice to project on the tablecloth itself. The second layer is the shadow of the video through the tablecloth on the wall, which creates a blurry image. The third layer appears only when the tablecloth gets blown up by the ventilator. This will reveal a sharp video image on the wall. At this uncensored moment a ‘real’ and confronting video image becomes visible. Using these layers gives the viewer a chance to discover the artwork in different phases of time. These three layers in my video installation make a subtle reference to the Chinese way of dealing with censorship: Mostly the unwanted events are not shown towards the outside world, but sometimes, by chance or my mistake, we can see a fraction of this hidden reality. For this work I experimented with different working methods based on processes to create an artwork. Because of this I made a choice for this installation to start my research with various materials to project on, instead of working throughout a certain concept, topic or technique for example. My search for material ended in a local Chinese restaurant. There I found a white thin plastic tablecloth, which felt like silk. This cloth was made from recycled plastic water bottles. I recorded the video at the location where they collect these bottles and suddenly the girl appeared. With her presence she created an extra feeling of disturbance in the video by the contrast of the innocent child in combination with the pollution surrounding her. To strengthen the disturbing atmosphere I slowed down the original sound recording together with the moving image to a low and undefined ‘unheimlich’ sound. 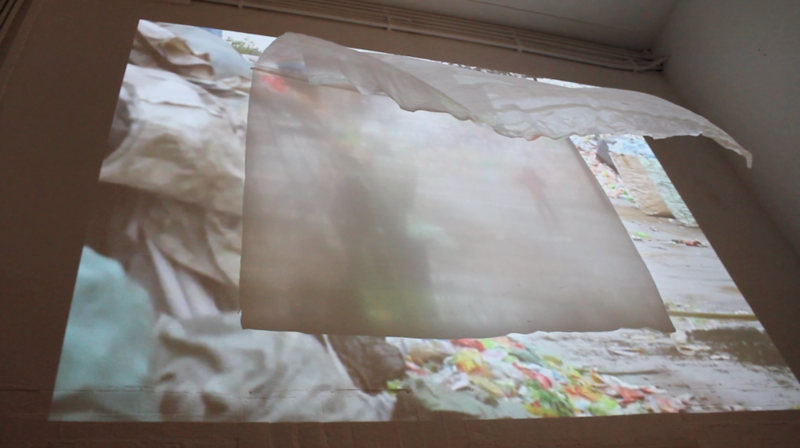 While exhibiting the video installation, interaction occurs when a person walks in between the ventilator and the tablecloth. This breaks the continuity of the constant airflow. Hereby, different wind movements arise that have consequences on the tablecloth movements. This interaction causes an unpredictable result. This is interesting for me; as an artist I lose some control of the presentation of my artwork.